Before you start posting, please read these Guidelines. If there is anything that is unclear, or if you're in doubt please feel free to contact one of the Moderating team here at GalaxyNexusForum.com. Please Note: This is a privately owned forum. We, The Owners and the Moderating Team, reserve the right to accept or decline your membership application, so you are not guaranteed membership and your membership is subject to revocation. 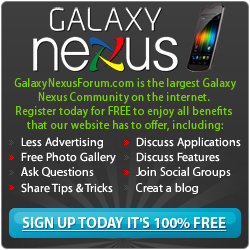 We reserve the right to declare what is suitable and what is not on GalaxyNexusForum.com. Advisory: All posts on GalaxyNexusForum.com are to be in the English Language. 5. We have a zero-tolerance approach on SPAM. If you post spam, you risk your account being permanently banned and your topic will be deleted. No advertising is allowed on GalaxyNexusForum.com without prior approval by the ADMINs. * No external links as indicated above should be posted in your signature - exception is of course the links to personal blogs, facebook, twitter, G+..
13. DO NOT advertise anything that costs money. Offering Items or Services to Trade, are not allowed. Anyone trying to use GalaxyNexusForum.com to advertise any item for sale will be issued infractions and or banned, and their posts will be deleted. GalaxyNexusForum.com is not Ebay or Craigslist. 15. Warez, Paid Apps for free, Paid Apps included in ROMs, the Sharing of Paid Apps for FREE is not allowed on galaxynexusforum.com. Warnings, Infractions or Banning May Result at the Moderator's Discretion. Last edited by 1KDS; 04-22-2012 at 05:55 PM. curiousitos and LinuxWiz83 like this.